As the crisp London days grew shorter, and Christmas rolled ever closer, I found myself on a train trundling towards the outskirts of London to visit one of the most unique and magical houses in the country. ‘Strawberry Hill’ is an intricate bauble nestled within Twickenham on the banks of the Thames (of whose waters the gardens once boasted picturesque views, though they are now curtailed, juxtaposed instead with surrounding surburban houses). Leaving the street and stepping through the gates is like stepping through a magic portal – not only back in time to the late eighteenth century when the villa and gardens were designed and built (they’ve been beautifully preserved and are currently being expertly, painstakingly restored), but also off into a magical, otherworldly space straight off the pages of a fairy tale (or a Gothic novel). That’s because the house was designed to resemble a Gothic castle by none other than Horace Walpole, author of the first Gothic novel, The Castle of Otranto (1764), which was actually written within and inspired by a dream-vision of this very house. Drawing from illustrations and visits to medieval ruins, Gothic tombs and crumbling abbeys, Walpole designed his house to be an enchanted place, a functioning mirage, a dreamlike retreat from the world – and that is exactly what still stands today, its fairytale turrets rising above the otherwise humdrum rooftops of Twickenham. My visit on this gloriously sunny winter’s day had a specific purpose: I was writing an article for a special edition of the journal Image [&] Narrative to celebrate the tercentenary of Walpole’s birth, and I wanted to investigate – to experience -the ways that space and optics are manipulated within the villa to create a sense of layered, unfolding and multiple space, and a sense of the otherworldly. I also wanted to investigate the ways that the house functions as a kind of narrative – a story – in itself (the resulting article goes on to compare the house in these respects with Walpole’s novel The Castle of Otranto and his play The Mysterious Mother). While I had already consulted photographs, illustrations and even Walpole’s own extensive description of the house and its contents, I knew that nothing would compare to actually seeing and moving about within the house itself, and so it was that I found myself at the gates of Strawberry Hill. The house was officially closed for the year, but I was incredibly fortunate to be granted a quick private visit for my research. From the moment I entered that enchanted space, I could not have been more thrilled with what I discovered, and I spent the next week utterly elated after the experience. My hopes were confirmed: not only does the house resemble a fairy tale castle, but through its manipulations of optics and space, and the intertextual fabric of its design and decoration, it becomes a fairy tale too, drawing the viewer in to participate in a performance of imagination and association that evokes a multidimensional atmosphere of magic, fantasy, and other worlds. But let’s start at the beginning. I began, of course, with the outside of the house, which is nestled within a complimentary mixture of manicured and woodland gardens (Walpole was insistent that the gardens were an integral part of experiencing his design). As you can see in my photos below (images really are better than words when it comes to Strawberry Hill, as Walpole also intimated), the various vantage points looking back over the house reveal its absolutely breathtaking effect, while a closer look bears evidence of Walpole’s pick-and-mix approach to architecture, where he borrowed elements he liked from different time periods and architectural styles, from castles to crypts, resulting in a truly fantastic vision of imagination. This is art over historical accuracy, and in this we can already see a blurring of the boundaries between the architecture of the Gothic revival and the literary Gothic novels. After wandering about the gardens and woodlands, and enjoying the sensation of being in my own fairy tale (greatly helped by Walpole’s Rococo garden seat above – designed as if for a mermaid), I turned towards the house itself. It was the hidden interior – the secret treasure within – that I really sought. It is within these infinite spaces, alternately hidden and revealed to the eye, that the ghostly lurks. The design elements borrowed from crypts and tombs add to the sense of the Gothic, while the merger of light and dark – the “gloomth” (Walpole’s lovely term) – evokes a sense of movement from the subterranean crypt to the vast regions of the heavens. This process occurs nowhere more beautifully or poetically than in the villa’s theatrical centrepiece: the great winding staircase which served as the principle entry into the building, and which was for Walpole “the most particular and chief beauty of the castle” and therefore “impossible to describe” – a visual spectacle beyond the reach of words (Letters 71). This “space draws on painterly techniques of ‘Chiaro Scuro’ (the juxtaposition of light and shade, and a label that Walpole applied to the entire house) to evoke the Gothic monastic atmosphere that Addison believed the natural habitation of ghosts” (Mills, ‘At the Limits of Perception’). As you can see in the photos below, the staircase evokes the swirling together of darkness and depths with light and ethereality, and it was surprisingly moving to experience it in person (still more thrilling to realise the potency of its effect centuries after its inception). Along with the beautiful, intricately carved library (a fantasist’s/gothicist’s dream), the staircase was my favourite part of the house. The intertextual fabric of the house, where both its architectural elements (borrowed from various other buildings) and the many and various collected objects it houses (which each came with a context, a history, and a narrative of their own, not necessarily verifiable) creates yet more layering of space, and a powerful sense of story. Each of these aspects refers “to a narrative that extends beyond the immediate architectural boundaries, and consequently extends the imaginative and temporal space that the house occupies.” As the visitor moves through the liminal, cascading spaces of the building, spectral visions of these extended narrative worlds are overlaid within the now crowded imagined space of the house, tumbling over one another to produce new narratives in the mind of the beholder. Word and image collide within this space: vision is alternately curtailed and freed, and evokes the imaginative powers of association and narrative. The stained glass windows are particularly representative: each one is a double window – a liminal view opening out onto the landscape beyond, and yet also into the narrative world depicted within its glass illustration (Mills, ‘At the Limits of Perception’). Through these manipulations of space, optics and the powers of narrative, Walpole’s Gothic castle enacts a “process of ontological destabilisation” in which the “Gothic liminal space overrides the authority of vision as a means of understanding” – an architectural resistance to some of the most pervasive philosophies of the eighteenth-century (Mills ‘At the Limits of Perception’). The result is a theatrical space – a “theatre of the imagination” – that hinges on a reciprocal performance between house and visitor, and word and image jostle in a magical evocation of story – of fantasy. The Gothic castle doesn’t just look like a fairy tale – it becomes one, and to enter its space is to enter a realm of living narrative. As I trundled home on the train, the sun dipping below the bare spindled arms of the trees, the magic of the house stayed with me. My deepest thanks are to The Strawberry Hill Trust for allowing me this special visit, and for their excellent work on preserving and restoring this most magnificent and bewitching of buildings. If you find yourself in London, the short train ride to Strawberry Hill is well worth the visit (find visiting info [HERE]). Mills, Kirstin A., “At the Limits of Perception: Liminal Space and the Interrelation of Word and Image in Walpole’s Strawberry Hill, The Castle of Otranto and The Mysterious Mother.” Image [&] Narrative 18.3 (2017). If you would like to read more about Strawberry Hill, and see how the house can be read against Walpole’s novel and drama, you can download the article here, or read the complete issue here. If you enjoyed this post, please feel free to share or leave a comment below! haha No worries at all – I think I spend more time adjusting “helpful” (incorrect) autocorrects on my phone than actually typing out messages! Great stuff Kristen – we met briefly at the Sheffield Reimagining conference and I’ve just started my MA Gothic at St Mary’s at Strawberry Hill! Thank you so much! 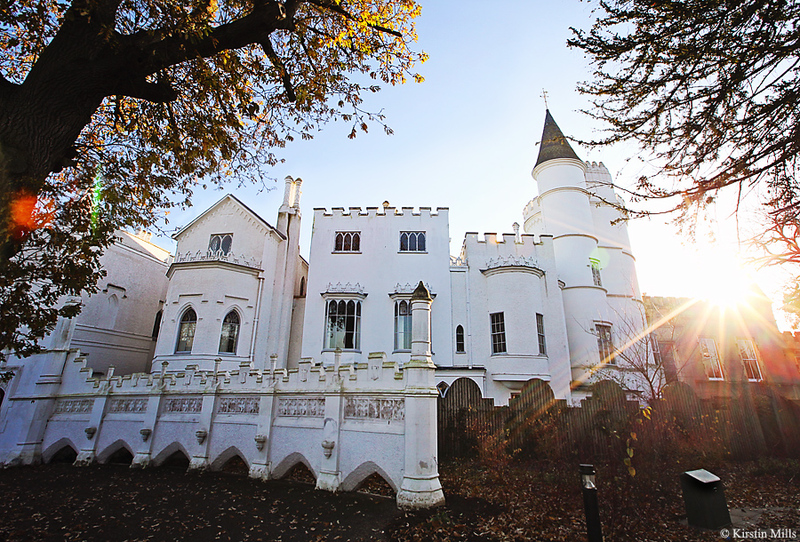 I remember chatting with you there – how exciting to study the Gothic at Strawberry Hill! Couldn’t think of a better place!